Tablet PCs Android sensation in local brand that is one option in the middle of a longer season Tablet PC trend in the world. In some ways, CSL Spice Mi700 DroidPad has a lot in common with Samsung P1000 Galaxy Tab that is both equally bearing the 7-inch capacitive touch screen and berflatform Android 2.2. 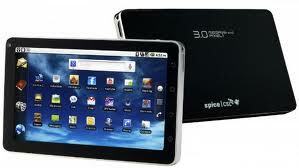 As Samsung Galaxy Tab, CSL Spice Mi700 DroidPad Smartphone combines function and Laptops. You can make a call using the phone, using a headset or loudspeakers to listen to voice your opponent speaks. You even can use it to send or receive SMS. The rest you can use this device like a laptop like that is to surf the Internet, Watch Videos, Enjoy the Slide Show, as well as to examine and edit office documents. CSL Spice Mi700 DroidPad this looks great, but when in digenggaman your hand feels light. Also, still lower if compared with the iPad. Casing design is relatively good and no hassle or complicated: providing a SIM card slot and an external memory which can be accessed from outside without opening the battery cover first. Sales package also includes a leather cover that look like a book cover that protects the exclusive rear, top, and front which makes the display CSL Spice Mi700 DroidPad looks like a diary or agenda book.